Khanpur Dam serves as a popular tourist spot for locals and foreigners alike. However, a recent tragedy might make people rethink its status as a tourist attraction. A motor boat recently caught fire while carrying 3-4 passengers in the middle of its journey according to recent reports. As a result of that fire, a woman lost her life. Two more people were injured due to the burns sustained from the fire. It is believed that the fire was caused by lack of proper maintenance on the boat as the motor burnt down. It is safe to assume that the people who run these boats rarely do their due diligence. Khanpur Dam features a lot of motor boats. These motor boats are often used to ferry excited visitors around the Khanpur Dam. One could have hoped that the people in charge of these boats could’ve taken adequate safety measures i.e. keeping their boats and their motors properly serviced, having life vests on board, emergency training in case of boat fire, etc. However this recent tragedy has exposed the woefully unprepared state of affairs at the Khanpur dam. The authorities need to ensure that the culprits are brought to task and that this sad state of affairs does not repeat in the future. 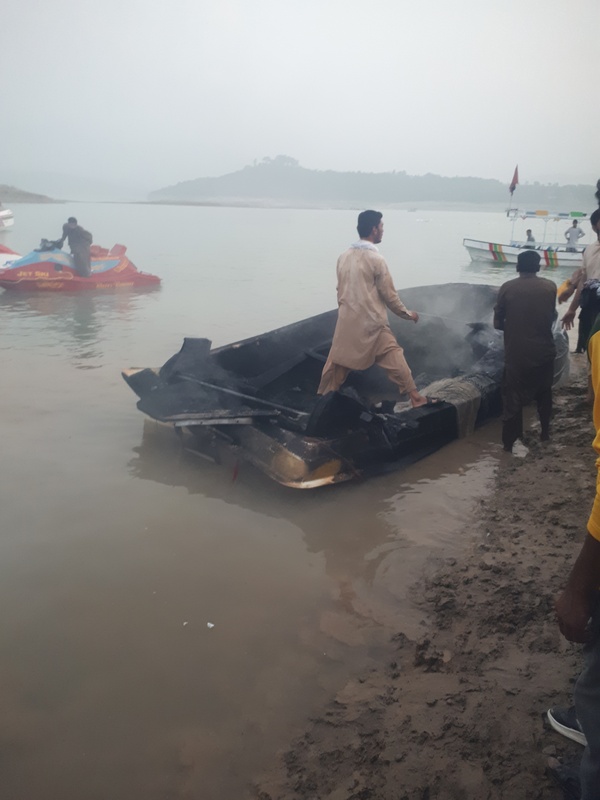 Given as how Pakistan is enjoying a surge in tourism after a very troublesome decade, there should be a zero tolerance policy for tragedies like the one that just occurred at Khanpur Dam. Are there any safety measures for boating. That’s horrible. Maintenance ka hi rola hai sara Pakistan me…! There wasn’t just 3 to 4 passengers. It was fully loaded and 12-15 people were there at the boat. What about life jackets? It they were wearing life jackets, it was easy for them to simply jump into water.